NEW YORK (CNNMoney) -- On the cusp of the most commercially romantic day of the year, some retailers are stepping into the exclusive (and profitable) market for all things wedding. Urban Outfitters Inc., the parent company of Anthropologie, Free People and Urban Outfitters, is debuting a new wedding brand, called BHLDN (that's pronounced beholden) on Valentine's Day. Following in the footsteps of J.Crew, the Urban Outfitters' collection will feature wedding gowns, bridesmaid and party dresses, vintage-inspired jewelry, headpieces, shoes and lingerie. But while J.Crew found a successful place in the wedding marketplace with silk taffeta and duchesse satin dresses that range from $285 to $3,000 each, Urban's new venture is not exactly cheap chic. Prices range from $1,000 to $4,000 for gowns, and $200 to $600 for event dresses. But spokeswoman Jennifer D'Aponte says that these dresses that are timeless (read: no matchy-matchy bridesmaid dresses in lavender taffeta). There's even a floral print wedding gown! In early May, décor and tabletop items like vases, dishes, silverware, tablecloths, candelabras, place cards, chargers, ribbons, cake servers and toasting glasses will round out the collection. For now, BHLDN will be available through its online boutique, but the first store is expected to open in the second half of the year. For those still reeling from a recession hangover, famed wedding dress designer Vera Wang also debuts a new collection of more affordable dresses and accessories this week. With prices ranging from $600 to $1,400, her collection for David's Bridal officially launched in 150 stores on Feb. 11. It's not her first foray in mainstream offerings: Wang partnered with Kohl's on a lower priced clothing and accessories line called Simply Vera Vera Wang in 2006. But this time, Wang is sticking to what she does best: weddings. 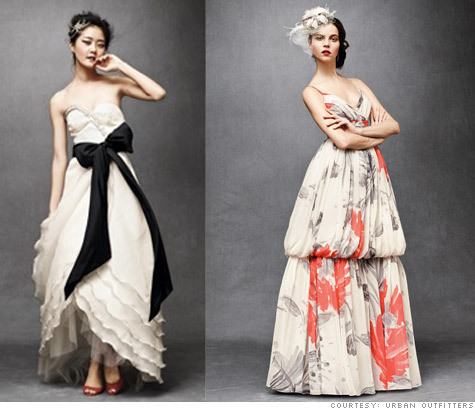 The White by Vera Wang line will expand to offer bridesmaid dresses and shoes later in the year. RentTheRunway, which Savvy Spending has covered before, recently launched a wedding section on its site, too. For $50 to $125, members can rent rehearsal dinner, engagement party dresses and a slew of bridesmaid options. But no wedding gown rentals as of yet.